UO MFA Students and UO Art Department faculty member, Anya Kivarkis, visit with PSU MFA student, Will Bryant (talking in middle) in his studio at PSU's Art Department. … [Through] this exchange. . . . we get to deliberately recognize the shared connections, conceptually and regionally -as well as the differences between the departments. I think the various Graduate Schools in the region have been having a real impact on the nature of the regional art scene – alumni have been actively exhibiting and teaching, and all the departments have been sponsoring exciting events and bringing in interesting guest lecturers -I think this energy has been helping shape the current state of the environment; something that seems to me to be getting more engaging daily. By bringing these departments together for dialogue we’re both highlighting the energy that is already there, but also helping foster the future art environment that many of the participants will be a part of. Will and I were up first for visits, at 9:00 and 9:30am. I met him on the way to the closet where our dying projectors live. “I think there are only about 5 of them (students and professors)” he said. It turned out there were a whole lot more than five people packed into my studio an hour later. What I thought was going to be meeting to organize the Ditch show turned out to be a full-on studio visit-slash-crique[sic]. I really appreciated all the thoughtful feedback. It’s what I came to grad school for. I’m looking forward to seeing what my new-found peers are up to in Eugene. –Portland State University MFA student, Steve Brown later describes the morning of February 22, when he and his PSU MFA cohort, Will Bryant would be the first PSU students to be involved in the exchange. 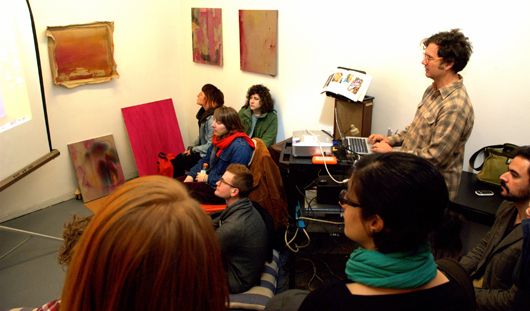 On this day, February 22, Brown’s audience consisted of, as he depicts “a whole lot more…than five” MFA graduate students from UO Department of Art, on-site here in his PSU art studio to engage in a critique-exchange between a core group of students enrolled in the two universities’ MFA programs. There were, in fact, 12 MFA UO students participating. As Brown continued, his admittedly magenta-obsessed canvases hanging from white, sheet-rocked walls of his cozy studio space, students experienced a ‘best of both worlds’ collaboration. It was a chance to learn of each other’s method and progression, to offer suggestions, thoughts and reactions, and to, potentially, forge partnerships between the students and future work. At first, the stationary audience remained relatively quiet, politely tentative, the soothing warm hum of the projector’s fan the loudest sound in the room. They were, after all, in someone else’s sacred and personal space–the studio of an artist where process and practice, experimentation and the personal determination to create, respond and react flows and weaves in a confluence of the unpredictable, exploratory and innovative mind of the emerging artist. Revealing work not yet completed can be a daunting task possibly leaving one open to on-the-spot criticism, questioning and explanation. Talking about that work with an unfamiliar audience requires a certain learned boldness, and a willingness to be receptive to query and suggestion. One might say, this is the role of the student-artist—remaining open and hospitable to comment and receptive to recommendation while retaining a willingness to adopt and adapt. The critique process is still just that—a critique and anything to make the procedure more friendly, more helpful and more constructive eases the tension and smooths the experience towards a fully-realized, finished work. 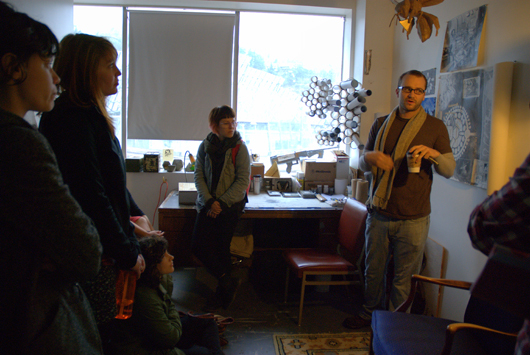 PSU MFA Student Steve Brown talks to UO MFA students about his work during the winter 2013 MFA studio visit exchange. In the words of Lenoir, these visits connected the students to an ability to realize they are “not doing this alone or by [themselves].” The experience was “invigorating and gave [Lenoir] a chance to be in another place where [he] could experience the work of other students,” he elaborated. With Rosskopf’s “why” the floodgates of enthusiastic inquiry were essentially thrown open: the intention and possibility of the studio visit suddenly becoming apparent. UO instructor, Jack Ryan would later describe it as having a “freshness” and as imparting an opportunity to “nurture the closeness of looking at each other’s work and a time to savor the experience.” This was a time to ask questions, become familiar with each other’s work and philosophy; this was a chance to reach out and understand, to unleash a creative mind and deepen and enhance learning. The comments and questions kept flowing after the initial ice was broken…so much so that after each presentation, students had to be reminded it was time to move on to the next visit. It soon became apparent connections were being made, productive friendships based in shared artistic theory were being forged, and the engagement provided by the studio visits | student interaction could possibly translate into work being effected. At the end of the studio visit with PSU MFA candidate Will Bryant, the enthusiasm to collaborate on a shared art project prompted Bryant to reveal, “the thought behind [these works] is more about the collaborative process.” Evidently thoroughly enjoying the experience, he continued, asking “how much fun is too much fun?” exposing the drive to frame a practice in mutually beneficial and inspiring partnerships. By the end of his presentation, Bryant was offering to “make a small piece of someone else’s work…” as an expression both performative, and transformative, warmly blanketed in cooperation. Several students seemed eager to explore this provocative opportunity. As the day continued, what could have been a sort of jury-of-your-peers subjugation, was, without a doubt, a meeting of like minds, receptive communication and shared conversation: providing the impetus of something more to come. PSU MFA student Mami Takahashi talks to UO MFA students, see next photo below, as they watch her explain her work. 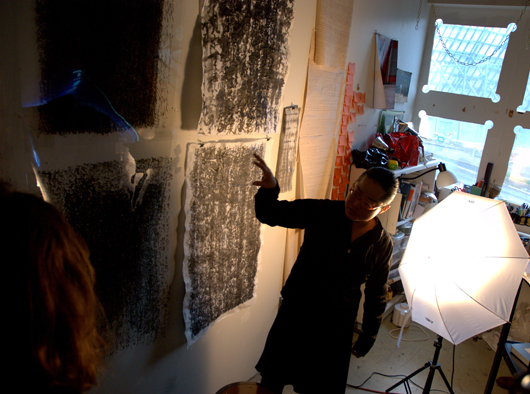 PHoto shows the view opposite Mami Takahashi (see previous photo above) as she addresses the UO MFA students during their visit to her studio. The UO | PSU MFA student studio visits and collaboration are at the suggestion of University of Oregon School of Architecture and Allied Arts Department of Art associate professor, Jack Ryan and Portland State University College of the Arts: School of Art + Design faculty member, Sean Regan. Over a year in the planning, the studio visit collaboration came to fruition on February 22 when Jack Ryan brought 12 UO MFA students to PSU to initiate the partnership. Also participating is Anya Kivarkis’ UO graduate colloquium. Ryan and Regan hope that what took place on on Friday at PSU’s Art Building will become a yearly event for the UO graduate populations. 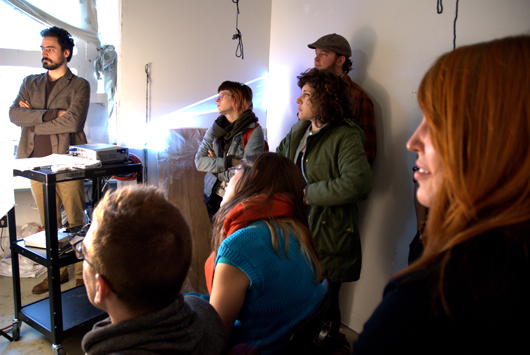 UO MFA students listen to PSU MFA student, Isaac Weiss explain his work and process during a studio visit. According to Ryan, “these studio visits will help inform student’s decisions on their prospective exhibitions.” And, as a result of this collaboration UO Department of Art is “hosting PSU at Ditch Projects in [Springfield]” for a Friday, March 8th opening from 6:00p.m. 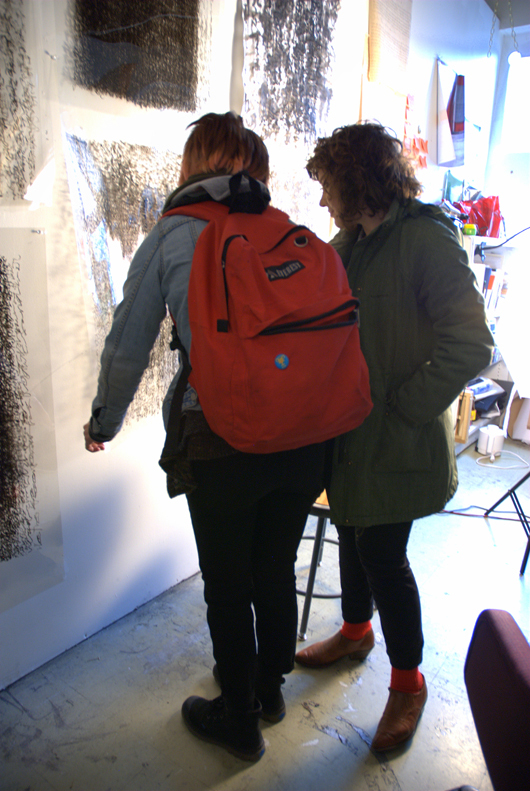 to 9:00 p.m. On Saturday, March 9th the PSU students will be visiting UO MFA candidates’ studios on the Eugene campus. PSU will follow by curating and hosting an exhibition of UO MFA candidates’ work on Saturday, May 4th (opening 6:00 p.m. to 9:00 p.m.) at the White Box in the White Stag Block at the UO in Portland. The White Box exhibition will run from April 29 to May 4. The natural consequence of this commitment to the work and the students’ experience in the program, led to a determination to establish the studio visits on a more permanent basis. The collaboration brought about a direct dialogue between the PSU and the UO students who are getting to work together and perhaps influence and enrich each other’s work, process and practice. Giving the MFA students opportunity to explore and question each other’s work in a productive and shared environment can contribute to a source of communication, meaning and perspective shedding new light on their practice and strengthening their educational experience. With the cooperation of a forward-thinking and insightful administration committed to and willing to believe in its instructors and their proposals, Ryan and Regan have successfully led a collaboration that broadens their students’ educational experience and immerses them in a vibrant community of regionally-based art and creativity offering to their students the chance to dream more, learn more, do more and become more(1)…. Having the foresight and the sense of collaboration and cooperation to frame an art exhibit that contributes to the well-rounded education of an institutions’ students stands to benefit all involved…. The Portland State University MFA students involved in this collaboration are, Mami Takahashi, Steve Brown, Will Bryant, Rene Allen, Leif Jacob Anderson, Mark Martinez, Wesley Petersen, Perry Doane, Kaila Farrell-Smith, Ernest Wedoff, Kathryn Yancey, and Isaac Weiss. On left, UO's Morgan Rosskopf and, on right, Nika Kaiser.